Basically, any dog/cat related items you bought for your foster’s happiness and need, which nobody's going to reimburse you for. Please note: you can't directly benefit from the purchase either. So no pet pleasure cruises, people! Btw, here's information on the 2004 landmark case that made it all possible: Van Dusen v. Commissioner of the IRS. Read this and you'll never say "that crazy cat lady" again. But wait, there is more. You can also deduct your travel expenses if they directly relate to fostering and rescue activities. This includes keeping track of your schedule, mileage and tolls paid to get to and from any adoption fairs, veterinary hospitals, home checks and potential adoptive family home appointments. You get the point. Check the above mentioned sites for the latest reimbursement per mile allowance, then build a simple spreadsheet and start crunching those numbers. And above all, don’t forget to keep it up as the year progresses. Since two years ago, there has been an important change every foster needs to know about: your rescue now has to verify your expenditures in writing. Once you tally all your purchases, sans travel, you will have to provide that annual total and receipt copies to your rescue. The rescue administrator will then issue you a letter (official letterhead in tow) that says something along the lines of “yes, this person does foster for us and in the process of doing that has spent $$$, which benefited dogs/cats in his/her care, but not him or her, etc." The above advice is for your entertainment and information only as I am no tax professional. For any advice on your particular case/purchases, it’s a good idea to contact the IRS itself to find out exactly what you can and cannot write off on your Schedule "A", Form 8283, Cash Contributions (out of pocket expenses) in addition to where the heck on the 1040EZ you should list these things in the first place. You thought I'd leave you hanging? Not a chance. 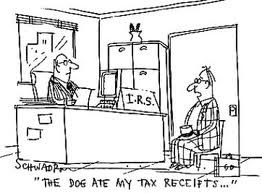 You can reach a real human being from IRS' official Tax Help for Individuals at 800-829-1040. I sure did.